Plate Charge: With Artwork Provided. One Time Charge. Unit Price Per Box: Print price per each box for initial and reorder Hot Stamped items. 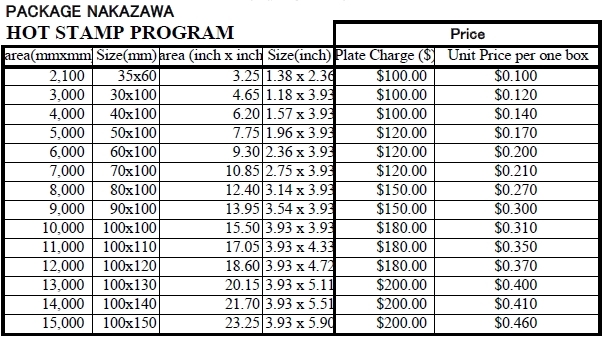 (Price per box is based on size of plate being used, not size or type of box). Run & Ship. No Split Shipments. If Stock Order Cut-Off Date for a container leaving on the 24th is: 15th of every mo. Item #'s : When our customer places an order, PN will assign a plate #. This # must be present in order #.